This is a well known favorite in Kerala cuisine.Jackfruit seeds are very nutritious and when cooked in coconut milk along with the sour green mango,produces a flavourfull and fabulous side dish to be served with rice.Unfortunately,fresh jackfruit seeds are not available to us,but I found some frozen ones during our Chicago trip 5-6 months back.Since then i was looking for green unripe mangoes,and finally got that too. So here goes the recipe ..
Add ground coconut ,mix well and let it come to a slow boil.Now add beaten yogurt,simmer for 2 more minutes stirring in between.Switch of the heat and keep it aside. Heat oil in another pan,and allow mustard seeds to splutter.Add red chillies,shallots and curry leaves and fry until they are brown.Pour this seasoning over the curry and serve with rice. This entry was posted on December 14, 2006 at 3:37 pm	and is filed under Traditional Kerala Dishes, Veg Dishes. You can follow any responses to this entry through the RSS 2.0 feed. You can leave a response, or trackback from your own site. Yeah..its very hard to find these ingredients here,Asha…i know that.. I love it when you come up with thani nadan dishes like these. Wonderful entry for the event. This is so good.Congrats for ur efforts .Many can learn the traditional dishes from here. Manchattiyundo???? I’ve added both Susan..as I needed my curry to be a bit thick..Also I like that extra sourness of the curd.. Anyway the original recipe doesn’t call for yogurt..I think i’ll mention that too in the post..
Wow! this is a perfect and tasty naadan recipe. I love that curry. My mom makes it the same way. Shaheen made me a little home sick last month or so with some of her recipes and now it’s your turn, huh? :))Anyways, thanks Annita for sharing this recipe. Oooh that is so unique and delicious Annita. Thanks for participating in JFI. You know our (Konkani) cuisine is quite similar to Kerala’s – we also have a couple of dishes with green mango and/ or jackfruit and they are all considered delicacies because of their unqiue flavor. Frozen chakkakkuru !!!!! Did you find it in an Indian store? I love this curry. Thank you. Yeah Archana,I’ve found it in an Indian grocery store…but not in my place..it was during my Chiocago visit..
hi annita chakkakuru curry looks so delicious…hey if you in chicago may be i will stop by to taste if its still there!!! :) i think next day it tastes even better. Annita, we add shrimp and drumsticks to this. Have you tried that? Haven’t tried that,Shaheen…It sounds delicious..will surely give it a try. I am scared to visit your blog.. each time when I visit,I leave with such a heavy heart.. I don’t even remember, when was the last time I had Chakkakuru!! wow! first kappa-meen curry, now chakka kuru-manga curry, every malayalees favorite. so happy to see all these foods showing up in the blog world. Good one Annita. Chakka kuru and Koorkka were the two indian veggies(? )that I have not yet found in any stores. Now you found chakka kuru, may be one day we see koorkka too. Yeah,I’ve already got a comment about Koorkka..
Oooooo! Perrrfect! Did you get fresh mango? Yeah…this time I got a perferct green mango..
this is my favourite curry. looks soo good..i am going to get chakka kuru this weekend…by the way, we get chakka kurru in the indian stores..i am in atlanta…i have seen frozen chakka kuru, koorkka, kadachakka etc here…Annita, ur kappa meen also looks soooo good..
My husband would die for chakka kuru aviyal..Thanks for the mention,maheswari..I’ve some chakka kuru left in my freezer..
Jackfruit seeds are usually roasted and eaten back home, never tried this way of cooking them ,Nice Recipe Annita. Annita, this one is a new one for me. I have always eaten jackfruit seeds boiled in salted water and then dried in the sun . And that was also ages ago.I like your recipe . Annita, this sounds absolutely delicious. Do you find the seeds in Indian stores here? Would love to try it. Really nice curry. 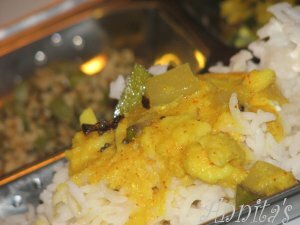 I never tried raw mango and jackfruit seed, I think this curry is similar to curd curry. Thanks a lot for sharing. Merry Christmas!!! Anyways, thanks a lot for sharing. Really good! !I became little nostalgic by seeing the picture.I got frozen chakkakkuru but no way for green mango.I hope I would get green mango in my next grocery shopping. I was really lucky to get nice mango this time.if you can get frozen green mangoes,that’ll be fine too..
What a wonderful rare combination. Sure to try. I love jack fruit. Wish u and ur family very hapy holidays!HAPPY NEW YEAR! Hi Annita,It has been long that I have not really wandered much in this blog land…seems to have missed quite a lot in every blog! !Ippo ethayalum ellavarum undakkunnathu nokki vellamirakkunnatha sukham!! ;) Busy with Christmas preps? Wish you a wonderful christmas and a rocking new year dear!! Merry X’mas and happy new year to u & ur hubby.. Happy Christmas to you, annita! Hope you guys have fun. Did you bake the plum cake this time? Happy Christmas to you Annita. Enjoy ! Looks amazing , i had one question ,how exactly do you grind the coconut to paste as here i dont have the stone ,tried with blender but that leaves bits of coconut bites,what would be the best machine to do the job .Thanks. I’ve got an Indian type Preethi mixer,which I bought through Internet. Instead of adding curd you can mash some of the kurus. This will also make the gravy thick. One has to be very careful about heating curd as it can get spoiled or curdled if done for too long. So those who are not the so called “expert” can try this version too. Thanks for sharing these info,julee.. Your post made me remember those meomrable days back in India. What is the brand of the chakkakuru you’ve bought(is it Swad or Deep?). Or do you remember the name of the shop you got it? I’ll persuade our local Indian grocer to stock it here!!! It is something called ‘Daily Delight’ brand,Srivalli.. This is a wonderful recipe i was longing for..Thanks.Btw…i didn’t get any Jackfruit seed so tried this with white channa and mango which was equally good.Thanks again. This is my husband’s fav curry, i’ve never tried making it here. (I’m in Dubai). Well, after seeing ur recipe, I feel I can make it…. I regularly checkout ur site for cooking ideas…. 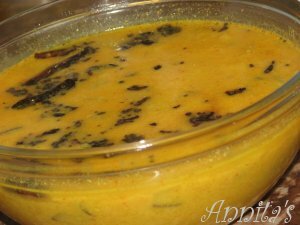 i tried this recipe of chakkakuru-mango curry today. It turned out real good. thanks for this. saw your dry flower arrangements too… u hv a real artistic touch. u remind me of my best friend sheena who is a great cook as well as an artist.. not a professional but itz an inborn gift/talent. thanks and keep doing the good job. Thank you for your kind words,Kavitha.. Annita!!!!! !thanx for the recipe. During my last trip to Chicago I had this curry and I loved it. After coming back to Bahrain (where i am staying)i got some varikka chakka. i searched through the net for chakka kuru manga curry and i got ur recipe. Congrats annita !!!!!!!! Its really a mouthwatering dish. My husband loved it. In London Chakkakuru is available in almost all Sri Lankan shops. Try that way :).